KEN RUSSELL TRACK AT COWBOY STADIUM – With the inches of snow melted and fresh sunlight shining through the clouds, runners and throwers in shorts sat cross-legged on the rubber track listening intently to head track coach Steve Simpson. Spring Break has just ended, and more than a few runners are using this last week of practice before the first meet to get back into shape. The group of girls who attended the state meet last season. They are, from the left: current sophomore Bailey Rock, junior Annie Bathurst, former senior Elise Jones, junior Savannah Stout, senior Abby Barnes, junior Beth Holmes, and senior Sydney Burton. 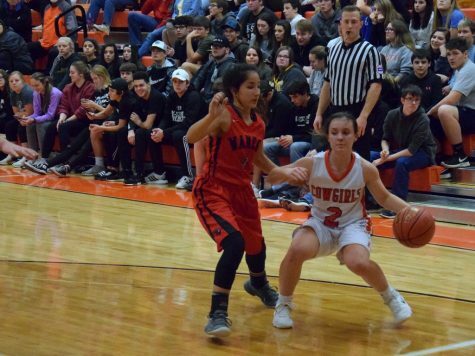 Some of them have just come off of a successful basketball season and are looking to make waves in the track circuit as well. 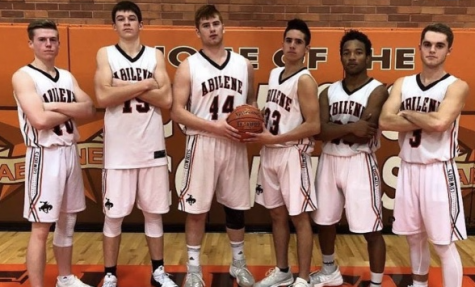 Seniors Damian Hartman and Sydney Burton come to mind; both seniors led the Abilene teams to NCKL victories in basketball and look to do the same in track. Both are what Coach Simpson calls “mid-distance” runners, or runners that perform in the 400-800 meter range. 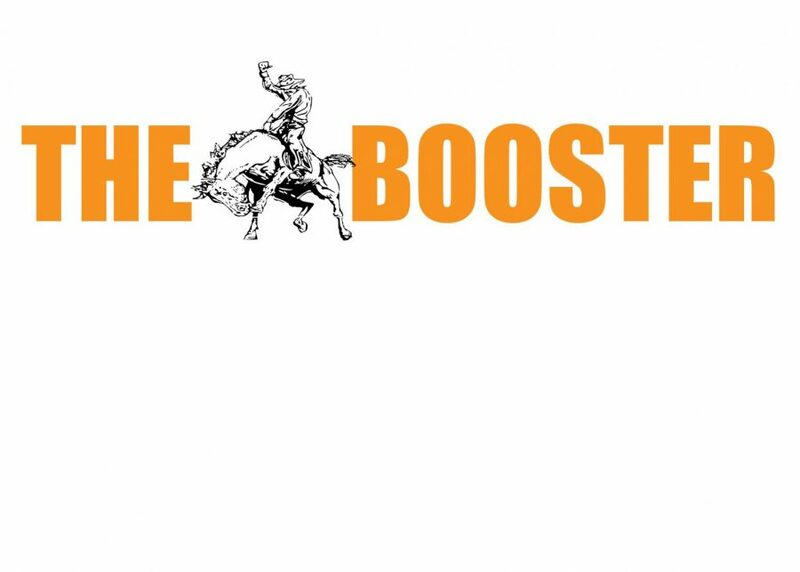 Preston Boyd, another senior Cowboy, looks to add depth and a possible state placing in the javelin, and junior Beth Holmes will compete for a top spot in the state from the hurdles. The group of boys who attended the state meet last season. They are; top row: former senior Chris Davies, senior Damian Hartman, senior Zach Schultze, senior Preston Boyd, former senior Ben Wright, senior Dylan Scherbring. Bottom row: junior Christian Radabaugh, senior Lucas Cook, former senior Dominick Campbell, and senior Dakotah Whiteley. 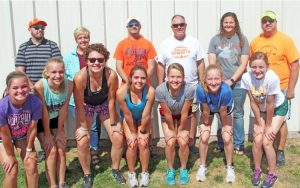 Coaches Simpson, Burton, Hartman, Klein, Bell, and Moyers return to help an incoming class of freshmen as well as returners back to the NCKL crown they last held two years ago after ceding it last season. 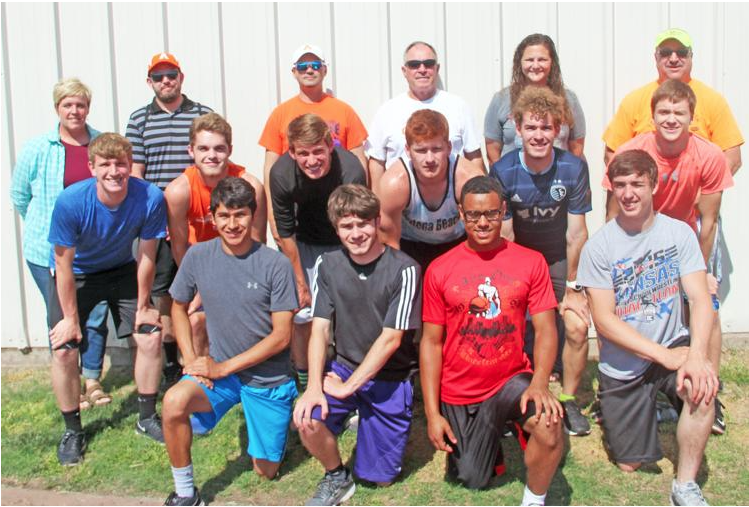 The field of throwers will look drastically different with the losses of Josiah Schwarz and Kade Funston, yet the retention of boys’ throwers like seniors Preston Boyd and Christian Stevens and the return of senior Grant Weishaar should keep the boys in contention amongst some of the NCKL’s top throwers. 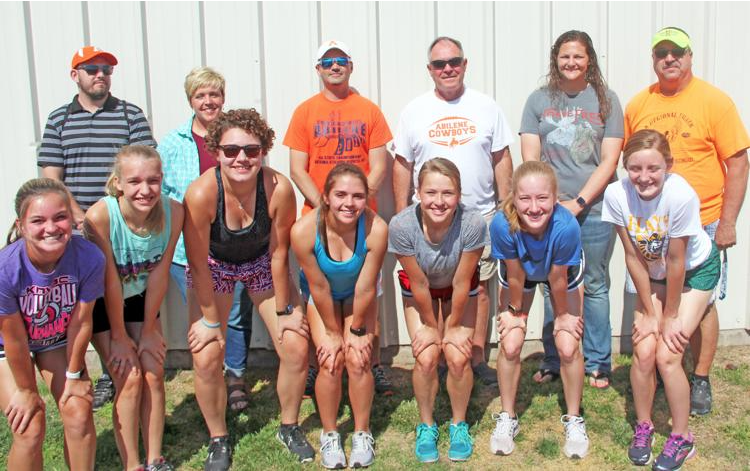 Boyd attended the state meet in Wichita last season for javelin, yet also succeeded in the discus and may also throw shot put as well. The loss of Elise Jones will hurt the girls, but a new crop of younger girls may rise up to take her old spot this season. Girls’ throwing is an event that Abilene has consistently succeeded in over the past few years, and it would be unsurprising to see a few Abilene names up top come the middle of this season in a few meets. Senior Kylie Coup will fill that shot put spot fairly easily, and sophomore Allison Liby will be a name to watch in the javelin. Sophomores Grant Heintz and Caleb Burt will look to take over for a few outgoing seniors in the long and triple jumps. They both succeeded at a moderate level last year, and will look to push themselves to a better spot this year. 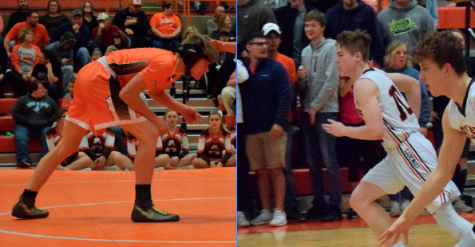 It is also possible that sophomore Mason Cook will also make a jump into the top three, as could junior Dakota Morton or freshman Cooper Wildey. Heintz will join senior Reilly Hanna in the high jump as the two compete in a small yet crowded group of NCKL high jumpers. The girls jumpers are in a similar spot to the throwers, as a few names could come out of the works early on or in the middle of the year. 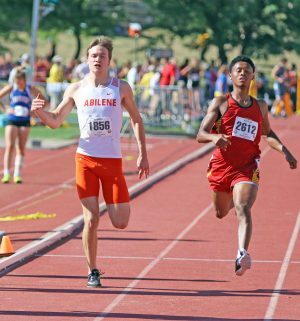 Youth is their greatest asset at this moment, and it remains to be seen how many of Abilene’s high placers will be underclassmen. 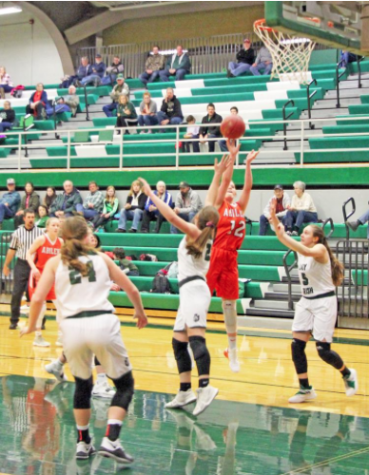 Reagan Ditto and Alyvia Johnson are a few name to watch. State placer Dakotah Whiteley returns for the boys, as does fellow senior Braydon Surritte, who barely missed a state bid last season. Zoë Cooper and Skyleigh Pflaster will also look to keep the vaulters in a high place amongst the girls of the NCKL. The record-breaking girls’ relay team from last season, consisting of (left to right) senior Sydney Burton, junior Savannah Stout, junior Beth Holmes, and senior Abby Barnes. 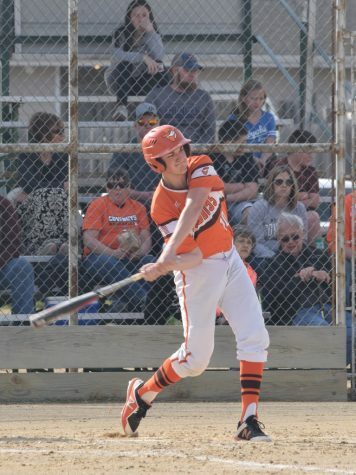 The conversion of Christian Radabaugh from mid-distance to long distance should help the Cowboys immensely in long distance standings after the loss of Ben Wright. 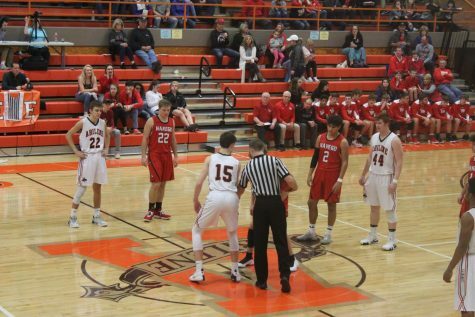 Junior Aaron Geissinger looks to combine with Radabaugh to create a tandem that will push Chapman and Clay Center for the long distance throne. 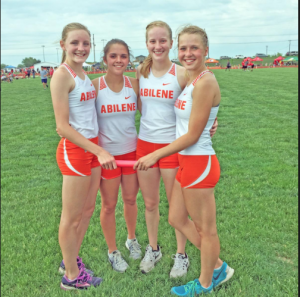 Junior Annie Bathurst will also look to pick up where she left off in that regard, combining with seniors Megan Anguiano and Sydney Burton in the mile and two miles to keep Abilene at the top. Senior boys Damian Hartman, Zach Schultze, and Lucas Cook return in the 400 and 800 meter races and relays. 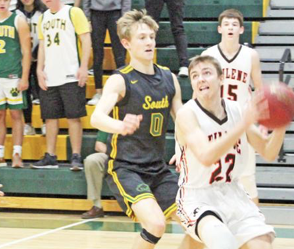 Newer faces, such as freshmen Nate Hartman and Luke DeDonder, will look to add youth to the group that saw multiple bouts of success within the lanes last season. The girls’ team changes little from last season. Sophomore Bailey Rock and junior Beth Holmes will also add some juice to relays alongside Bathurst and Burton. Sydney took home the 800m crown last year at state and will look to compete again. 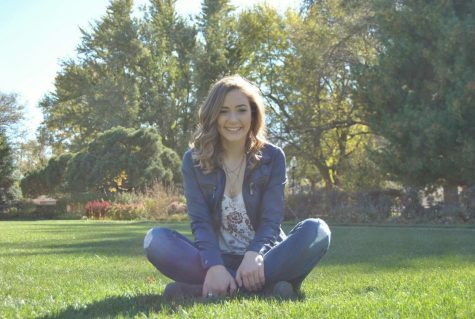 Savannah Stout will also be involved in many races across the distance map. Senior Abby Barnes will also look to add to her impressive 400m and 800m resumé this season with another followup. 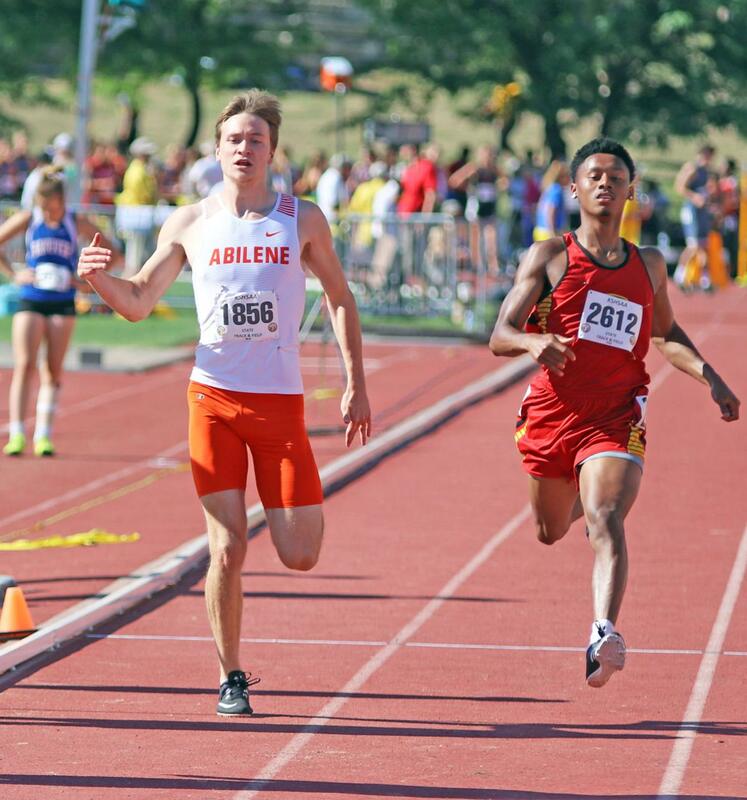 Dylan Scherbring at the state meet at Wichita last season. Lucas Cook will make a short transition to the 4×100 alongside Dakotah Whiteley. 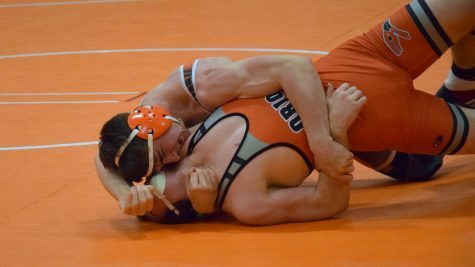 Damian Hartman and senior Dylan Scherbring took the team to state last season, so two legs will not be heavily affected. Dylan will look to return to the state meet this season. Junior Triston Stover could team with sophomore Trey Tovar to help the youth of the short sprint runners. As for the girls, the theme of youth will again be observed. While it’s not impossible to see Zoë Cooper or a few other field event players run a few sprints, it’s more likely that we will see a few younger specialists come out of the woodwork. Braydon Surritte and Mason Cook will look to catch up to Triston Stover and fellow junior Jonathan Richie. Dominick Campbell made an impact at state last season. Stover and Richie’s friendly rivalry will look to push them towards where Campbell was last season. Trey Tovar will also look to join in the hurdlers, as will Zach Schultze in select meets. As for the girls, this is all Beth Holmes’ division. She will compete with most of the rest of the NCKL’s girls at a high level, just like last year. Some girls could take some spots behind her. Junior Hannah Anguiano will also look to make an impact here, among other places. The first meet of the season will be on Tuesday, March 26th, in Holton. 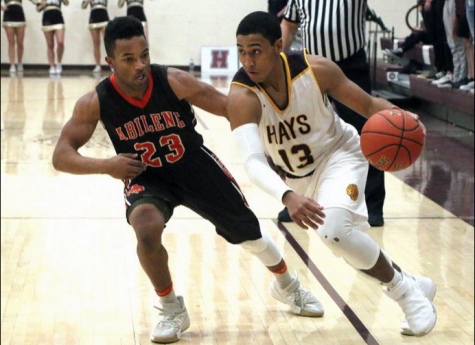 A meet the following Friday in Chapman will see some of the younger competition compete. Head coach Steve Simpson has been excited for a long time about this season, boasting his largest roster yet and one of his most competitive at the onset. This will also be the swan song for some seniors well-known across the Abilene zeitgeist. A special season to pay attention to, indeed.